Most Wilson Electronics antennas may be connected directly to the splitter using either the N/Male to N/Male adapter or using a length of LMR-400 cable. 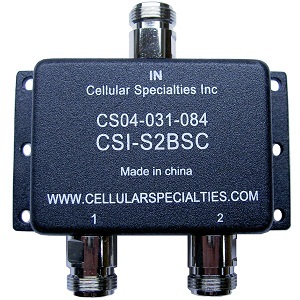 The 301121WPS Dual-Band (Multi-Band) Ceiling Mount dome antenna, 301121 Wilson Cellular Dual-Band Ceiling Mount Dome antenna and 301135 - Wilson Cellular Dual-Band Directional Panel Antenna may only be connected to the splitter using a LMR-400 cable extension. Size: 3.78" x 2.2" x 1"
Custom length ultra low loss cables for longer cable runs. Custom made, allow 1 extra day for assembly. Non-returnable.